Another Soup return to Clapham’s Omnibus Theatre to headline the ‘Whispers from the Walls’ season with their poignant interpretation of The Yellow Wallpaper. The production is based on Charlotte Perkins Gilman’s classic short story about a woman suffering with postpartum psychosis, as she struggles to receive the correct treatment to enable her recovery. Although the original story takes place in the late 1800s, the key themes within the text are incredibly relevant today. Whilst we have improved our attitudes towards mental illness since the Victorian era, Another Soup’s refreshing take on the story reveals how much of the stigmatisation still prevails deeply within society today. Gemma Yates-Round beautifully encapsulates the challenging role of Alice, and from her first moments on stage brings the audience emotionally towards her character. This intimate connection with the audience whenever she breaks the fourth wall establishes the way in which the director has cleverly chosen to stage what is originally a first-person narrative written by an author who had the same experiences. This particular interpretation of the text did not seem to be set in any particular era, and in many ways is yet another directorial decision from Dave Spencer to stay true to the dystopian setting of Gilman’s work. As well as this, the set design by Mayou Trikerioti and Cecilia Trono, further helped establish this unsettling atmosphere in addition to encapsulating the shifting consciousness of Alice’s mind. Whilst this story sheds light on the dated attitudes many still harbour towards mental illness, particularly when suffered by women, it also draws attention to wrong ways in which we can treat mental illness. In The Yellow Wallpaper, Alice is taken away from other people, and is strictly forbidden to engage in any creative activity and, as a result, this worsens her suffering. Perhaps in some ways this particular production alludes to the ways in which art can potentially assist in treatment for mental illness, as well as playing a role in further educating audiences on the journey of someone with postpartum psychosis. The Soul of Wittengenstein is a dramatic imagining of the philosopher’s time spent working, incognito, as a porter in a London hospital in WWII. The playwright, Ron Elisha, introduces the character John Smith, an illiterate navvy who is a patient in the hospital, and charts the development of a surprising but profound friendship between the two men. Within this simplest of plot lines, we are also treated to a whistle-stop tour of War and Peace, and some of the salient points of Wittgenstein’s linguistic philosophy. The play begins with a beautiful and revealing silent movement sequence from Richard Stemp, as Wittgenstein, underscored by a perfectly chosen sonata for cello and piano. The left side of the stage is barely lit, but we are aware of an inhabited hospital bed. This opening, showing the deft directorial hand of Dave Spencer that is present throughout, perfectly sets the tone of the piece. 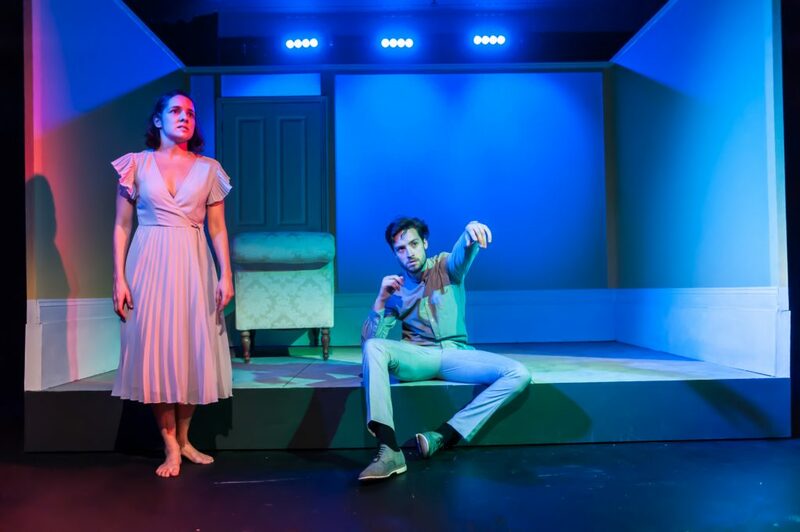 Compliments are due here to Rachael Murray (Sound), Clancy Flynn (Lighting) and Mayou Trikerioti (Set) for terrific production design, in which the sound, the lighting and the set continually worked together in subtle harmony. Richard Stemp ably embodied the capricious philosopher, described by Bertrand Russell as ‘the most perfect example I have ever known of genius as traditionally conceived; passionate, profound, intense, and dominating’. 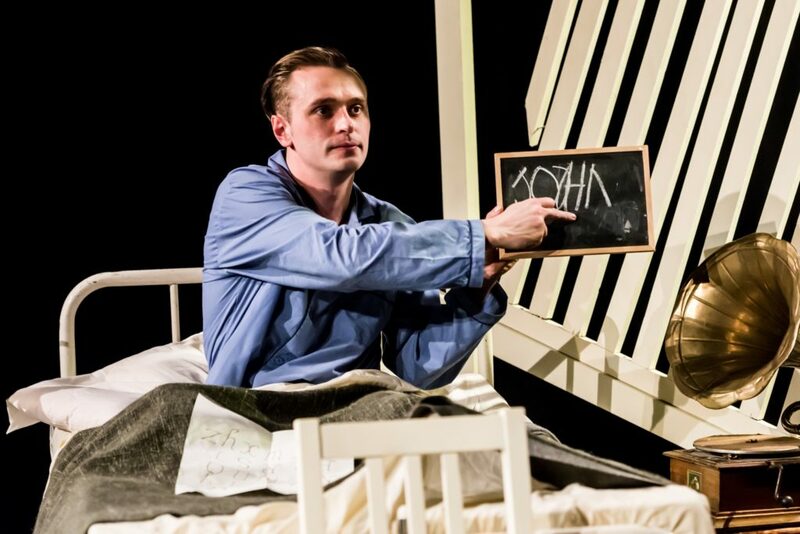 Wittgenstein, as seen here, is not immediately likeable – he is pedantic and emotionally disconnected – and it is testament to Stemp’s skill that we warm to the man as the play unfolds. Ben Woodhall gave a wonderful and utterly believable performance as John Smith. His naive charm and essential humanity were on display throughout and provided the perfect counterpoint to Stemp’s tightly-held genius. He also maintained an excellent Cockney accent of the period. It was just a shame that this was occasionally marred by errors in the writing of the slang. Cockney rhyming slang works as a code because the rhyming part of the phrase remains unspoken, hence ‘plates of meat’ (feet) becomes ‘plates’; ‘apples and pears’ (stairs) becomes ‘apples’ etc. Other than ‘brown bread’ (dead) – a notable exception – this is how it works. John’s relationship to Wittgenstein’s ‘dickie birds’ (words) is central to the play, and it therefore seemed odd that they weren’t the ‘dickies’ they should have been. The play’s relationship with words, as a whole, presented problems. Wittgenstein’s character, as well as the nature of his philosophical enquiries, is predicated on linguistic play and precision; thus not innately theatrical. For this reason, the play lacked pace; the audience would have been better served with a tighter script and twenty minutes taken off the running time. That being said, the high quality of the acting, directing and production design led to an enjoyable, and occasionally moving, evening at the theatre.